Just a little bit more about the stay in the hospital. I shot a lot of footage but didn’t get the opportunity to share all of it with you during my stay. First off, I noticed that I could view our condo from the hospital. Well, we could see the “B” building of our condo complex, the more easterly of the two buildings. We’re in the “A” building. Don’t you just love buildings that have large labels on them? It makes it easier to tell where things are. One of these days, thanks to augmented reality, we’ll be able to slip on a pair of spectacles and view the world in just such a way. Skyline looking towards the mid-Sukhumvit region. 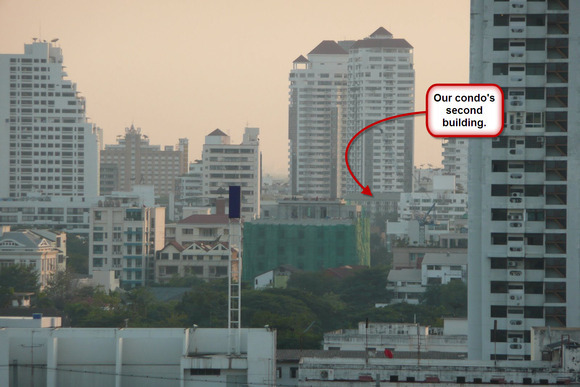 The tallest building on the left is the Emporium Suites in Phrom Pong. 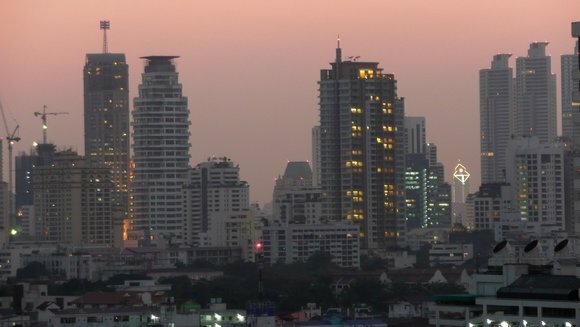 The two matching buildings on the right are two of four condo towers that have recently gone up on Sukhumvit Soi 16 called the Millennium Condos. The lighted building with a triangle shape is the headquarters of Kasikorn (formerly Thai Farmers) Bank, which is located on the other side of the Chao Phraya River adjacent to the Rama IX bridge. 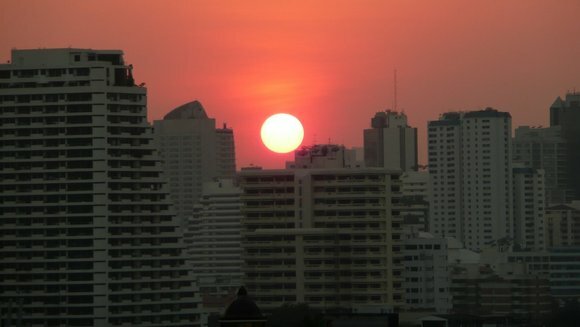 A brilliant red sunset over Sukhumvit as viewed from the hospital room. 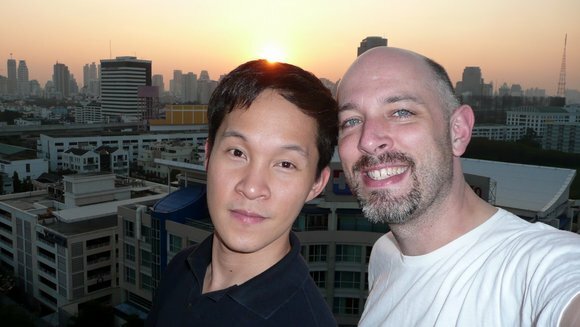 Tawn and I try to do a self-portrait on the balcony of the hospital room. The sliding doors to the balcony were locked. To get them unlocked I had to sign a release form, indemnifying the hospital from any injury, temperature discomfort, insect infestation, etc. I mentioned in response to a comment that I had one bad meal while in the hospital, the final breakfast. Departing from the all-Thai menu, I ordered a Japanese breakfast on Sunday morning. What arrived was awful. Just awful. Teriyaki salmon, as dry as cardboard with sickeningly sweet sauce; stewed beef and tofu; Soggy cabbage; incredibly salty miso soup. 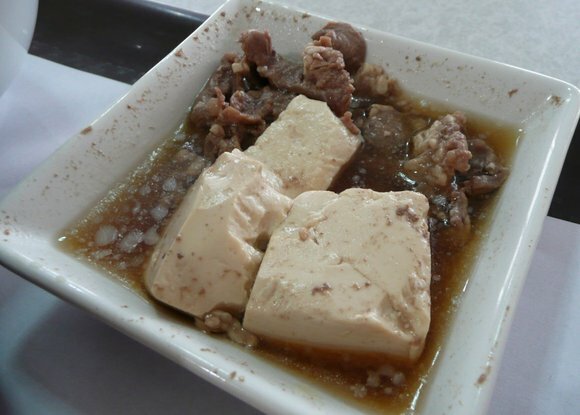 Now, I realize that getting food from the kitchen to the rooms and keeping it warm is a challenge, but I was a bit disgusted by the congealed fat on the surface of the stewed beef and tofu. Thank goodness for the microwave in my room, so I could reheat the dish, melt the fat and enjoy the dish. Here’s a short video that contains some new footage along with part of the hospital room intro footage I previously shared. It’s no secret that I wish I had cybernetic implants so that I could walk around and view augmented reality, with data not even at my fingertips, but accessible by thought command :)We’re looking at your food, especially the beef and tofu with congealed cold fat and we’re both thinking “ugh.”We were remarking, up until this, that your stay in the hospital looked much like a stay in a hotel; considering how nice the room was, and the quality of food you had. Up until this, hahaha. The food does look awful! If it looked like that, I wouldn’t even touch it. For me to ever taste something, it has to look good first and then smell good too. Tawn has got such a perfect skin! Btw, the music towards the end of the clip is cheesy! I just want an implant that will remind me who people are. I am just awful with names.I’m glad you snuck in a food review with your hospital visit. hee hee… Does Tawn always make a stylish entrance? Hey Chris, glad you’re finally out of the hospital. That being said, what a wonderful view and accommodations (minus the cardboard Japanese food)! I liked the additional video and the photos of the food… I’ve always gone by the rule that you never order a hamburger in a Chinese restaurant. I would suppose the same rule would apply across the board. Very nice sunset! Ooo, the augmented reality thing is so cool. I would love something like that especially for city skylines. I’m always asking what buildings are whenever I go to a new city. 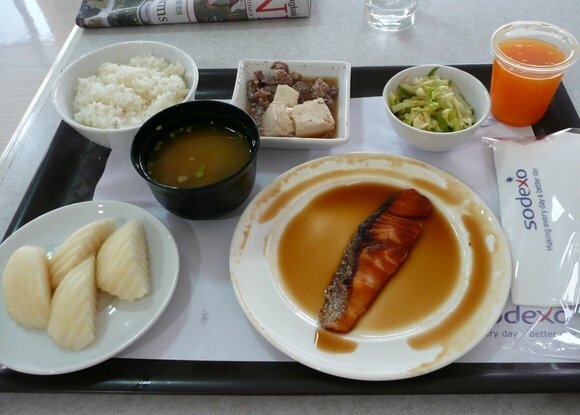 Phil can answer some questions for me but not all of them.Now as for your Japanese meal, that looks like hospital food! I hope you sent the pictures of the breakfast trays to the hospital administration.Great picture of the sunset, and of the both of you on the balcony. Funny that you had to sign a release. I can’t believe hospital food can be that bad!!! I hope it didn’t cause food poisoning!! That is quite possibly the nicest hospital room I have ever seen! I always pictured hospital rooms to be little cubicles. @lil_squirrel4ever – Believe it! =D@Rm2046 – It exceeded my expectations, too.